An electrical conductors transmits current when the outer-orbiting electrons of its atoms are released. Silver's atomic structure with 47 electrons (copper has 29) allows for "easier" escape from orbit and explains its explains its high conductivity and its superiority as an audio signal carrier. Stage III concepts uses only the highest purity grade of silver available. Conductor shape is essential in maintaining signal accuracy, and Stage III has approached this issue by developing proprietary AeroStrand™ conductors. 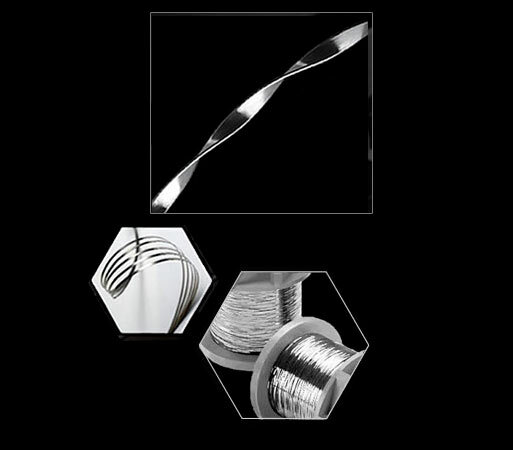 These flat, solid-core, pure silver wires provide a variety of sonic benefits; primarily permitting the use of true air dielectric. In addition, a flat wire's low cross-sectional mass and increased conductor surface area exhibits more desirable impedance characteristics. This allows transmission of all frequencies with perfect uniformity, AeroStrand™ conductors are therefore immune to the distortions of skin affect. Stage III's A.S.P. Reference series employs AeroStrand Ultra (tm) conductors, which are composed of a specially formulated alloy of silve (Ag) and palladium (Pd). Palladium, although not the best electrical conductor, possesses outstanding low susceptibility to electromagnectic influences that can affect accurate signal transfer. A carefully Ag/Pd conductor such as our AeroStand Ultra™ is the ultimate in sonic purity: natural, musical, almost magical.